The Guardian’s Jonathan Freedland has a piece this evening at the New York Review of Books blog whose ending I can’t resist quoting. 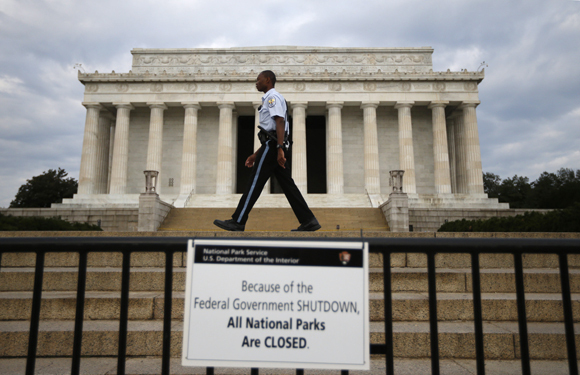 His subject is the view from abroad of the US government shutdown. … is mere prelude to the greater panic to come if Congress refuses to raise the debt ceiling, triggering a default. Markets around the world have October 17 circled on their calendars—and the global financial community is holding its breath. Perhaps this doesn’t matter much to American voters. They might not realize how closely the rest of the world—their economies as well as their media and popular culture—follow, react to, and are affected by the ups and downs of US political life. But they do. And right now, they look at the stalemate in Washington the same way they look at the periodic gun massacres that afflict the United States: with a bafflement that America, mighty America, for so long the most innovative, creative, energetic society on the planet, cannot solve problems that smaller, poorer, feebler countries cracked long ago. Americans might not realize it, but this shutdown, like the gun epidemic, reduces US influence in the world. It makes nations, and individuals, who still want to regard America as a model see it instead as a basket case. Abraham Nemeth Split the Infinitive. Please!